Type-2 Diabetes Mellitus is a chronic metabolic disorder characterised by Hyperglycaemia, Insulin-resistanthe state, increased lipolysis, and high risk of cardiovascular disease! We all know that. And much more to it.. 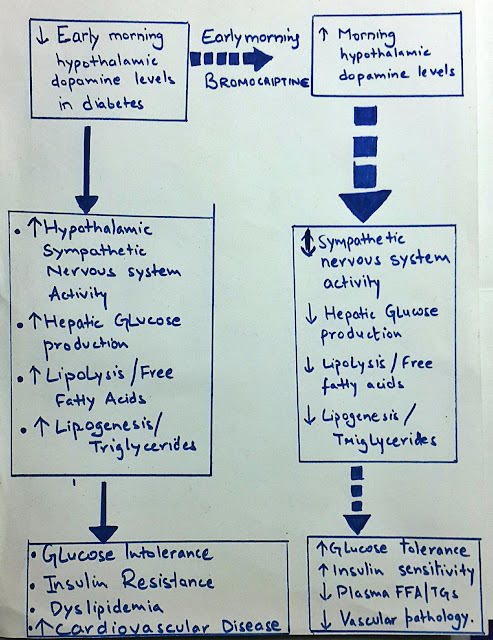 But how can Bromocriptine be used to control blood glucose levels in diabetics?? Increased sympathetic activity in diabetics leads to breakdown of fats and high levels of free fatty acids in blood, which makes them obese! Insulin resistance in turn activates endogenous glucose production cycles which results in glucose intolerance and high risk of cardiovascular diseases, hepatic failure, kidney problems and other systemic abnormalities! • Acts as a potent agonist of dopamine D2 receptors. • Intracerebral injection of 0.8mg Bromocriptine mesylate- quick release formulation, in Insulin-resistant state, is given after first meal in morning within 2-hours of awakening. • It acts in the Supra-Chiasmatic and Ventro-medial nuclei of hypothalamus and regulates circadian rhythm of Insulin sensitive-resistant cycles and controls Dopaminergic-Serotonergic neurotransmitter activity. • Simply saying, Bromocriptine reverses circadian rhythm from insulin-resistant state back to insulin-sensitive state, thus decreasing blood glucose levels back to normal. • It reduces blood glucose levels, but does not bring back to normal. That's why it is prescribed as an add-on drug with insulin or sulfonylureas. This makes an additive effect in the anti-diabetic therapy! ��That's a superb amazing post !! Yup it is! Bromocriptine mesylate 2.5mg oral tabs. for diabetes!! !